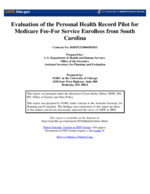 This mostly qualitative study identified key usability and utility components of a personal health record (PHR) being used by an elderly population living in South Carolina. The evaluation consisted of three phases: an environmental scan comprised of a literature review and interviews with sixteen PHR experts identifying common features, best practices, and technical standards currently implemented for PHR development and use; discussions with health care providers and beneficiaries (users and non-users) about their perceptions of PHR use and value as well as laboratory observations of beneficiaries using a PHR; and a syntheses of findings based on the prior two phases and adding a quantitative analyses from vendor PHR usage data resulting in a final report. The environmental scan identified varying PHR definitions, attributes, and models noting many 'flavors' of PHRs being offered in the current market. PHR types include health care provider intranet portals, independent vendor services and PHRs interconnected and networked through the Internet. Additionally, there are limited standard measures for PHR usability and utility and no specific guidelines for PHR development. Broad outreach and marketing strategies must occur to increase consumers' awareness about PHR value and to improve PHR use before measuring and determining any key or generalizable impact on the health of users. Barriers impeding provider PHR use include the potentially negative impact on office workflow, data inconsistencies, and the lack of reimbursement for provider participation. A few technical standards are available or in development such as those by Health Level Seven (HL7) and Integrating the Healthcare Enterprise (IHE).